Topline Secondary Social Studies Programme (2012) is a set of three books, respectively meant as textbooks for grades 6, 7 and 8 in Pakistan. Published by Topline Publishers, Karachi, it is a thoroughly revised edition of the author’s earlier series of the same title. 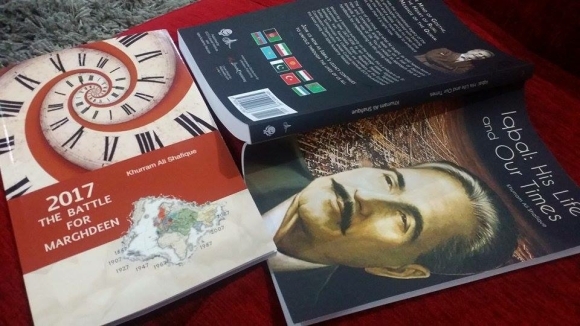 The books are meant to be more than textbooks: they incorporate much of the author’s original research about history and social sciences in the light of Iqbal Studies, and serve as an accessible introduction to some of the ideas presented by him in a more advanced form in his works for the grown up audience. [The following is the author’s preface, “For You…” that appears in each book of the series]. This is the book I wanted to read when I was a student in secondary school. I wanted to know what happened in the past, and I wanted to know what was happening around me. I was always curious about far off place and wanted to visit them – at least in my thoughts. Above all, I liked to look at beautiful pictures. In writing this series of textbooks, I have kept all this in mind. I have also kept in mind that English is a second language for our students, and many of them may not be very proficient in it at this stage. As a writer of Social Studies textbooks for English medium schools in Pakistan, I considered it my responsibility to write in an easy and interesting style. I have tried my best to avoid words and expressions that may be very difficult for the average student. I hope this is a book for you – as much as it is for me. As a writer, I know that if I enjoy writing something, then my readers are also likely to enjoy reading it. I hope this book will not only inform you but also entertain you, whether you are a student struggling with your marks, or a teacher stuck with a subject you did not want to teach, or just a general reader brimming with curious about the world. We have tried to follow the syllabus prescribed by the government of Pakistan, but we have also attempted to enrich it. Whether you wish to opt for O’ Levels or matriculation after using this series, you’ll find yourself better prepared (and yes, there is no need to use the Class 9 Pakistan Studies textbooks in Class 8 if you are using this series; rest assured our books will prepare your children better for their next classes). “Textboxes” are a special feature of these books: they break down the information into easily manageable chunks. The activities at the end of each chapter are intelligent, although (we admit!) not very original; we have kept these activities as they are so familiar to most teachers; you can consult our Teacher’s Guide for a host of other interesting and interactive exercises based on co-operative learning. We hope you’ll agree with us that the ideas for carrying out projects at the end of each chapter are imaginative, interesting, and above all, practical! Street address: Office No. 03, Bright Corner, Opposite Askari Park of University Road, Karachi. You can follow the public page for this set of books on Facebook: “Topline Social Studies Programme Book Series“. This set of books is not just for students. They incorporate much of the author’s original research about history and social sciences in the light of Iqbal Studies, and serve as an accessible introduction to some of the ideas presented by him in a more advanced form in his works for the grown up audience.